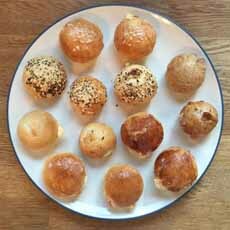 Bantam Bagels had a small shop in Greenwich Village, selling two-bite balls of bagel in different flavors, filled with a variety of cream cheese flavors. The novelty spread the word, and the plucky Bantams are now sold at 16,000 grocers nationwide. We love them all. They’re easy ways to have a tasty bite of breakfast, whether on the run (first, 20 seconds in the microwave) or settled in with the newspaper for a leisurely brunch. Bantams are a treat for the family as well as for guests. One of our favorite brunches is a mix of all three products. These are our secret indulgence, anytime we want a piece of cake. 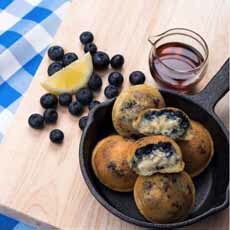 Instead, a bite of Blueberry or Chocolate Chip Bantam Pancakes does the trick. A platter of Bantam Bagels (all photos courtesy Bantam Bagels). 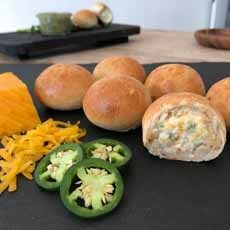 Wake up to jalapeño Bantam Bagels. Who could refuse Blueberry Bantam Pancakes? 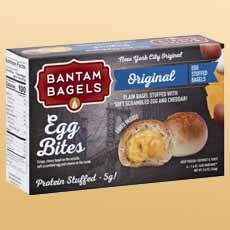 New Bantam Bagels Egg Bites. Our favorite technique is oven toasting, but we admit to regularly heating with a quick 20 seconds in the microwave. FIND OUT MORE AT BANTAMBAGELS.COM.